Needless to say, I did all of the above, and it was—very quickly—never seen again. 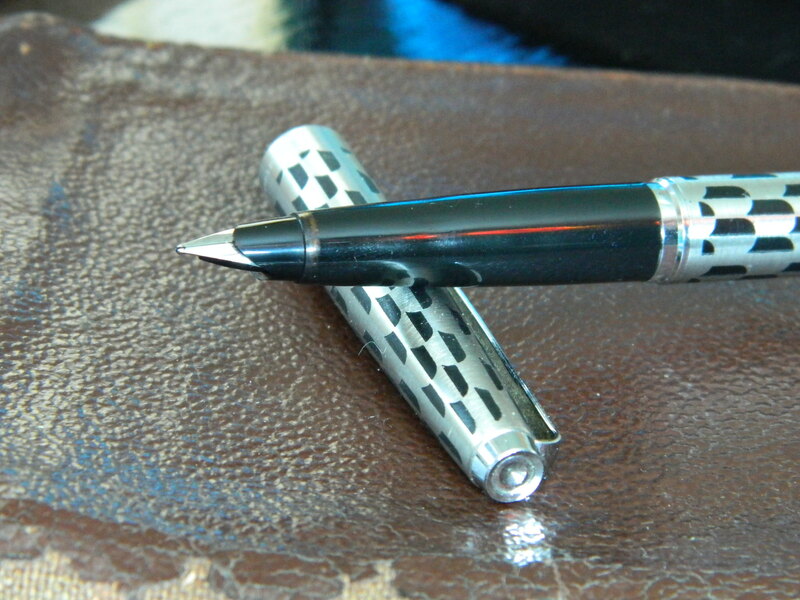 The same cannot be said of its sibling, the Parker 45 Harlequin fountain pen, with the dark shield body pattern. My mother took a great deal better care of that than I did the ballpoint. Maybe I can partially atone by looking after this one properly. I am no vintage pen aficionado, and make no claims to being one; but I’ll do my best here and relate what I know about the pen and how it performs today. The first thing I noticed about this pen was its outward condition. Aside from the minor scratches of almost 40 years on and in a writing desk, there are absolutely no dents, knocks, or blemishes of any kind. It’s weathered a great better than I have. Internally was another matter, it still had an old Parker cartridge inside which looked a great deal worse than it actually was. A lot of flushing with 70/30 diluted white vinegar to tepid water cleaned much of the detritus from the nib and feed. 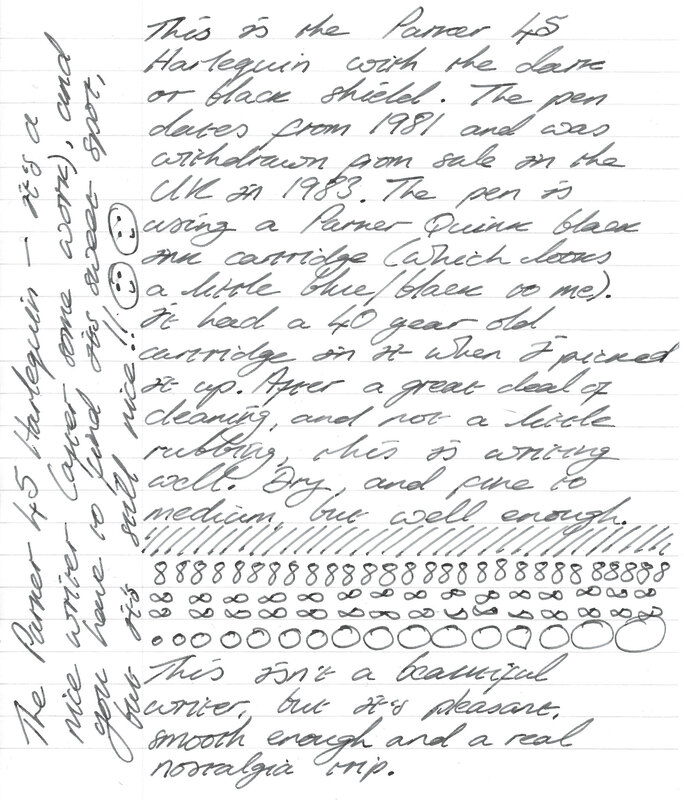 Then a night soaking in the same solution gave me a clean pen the following morning. 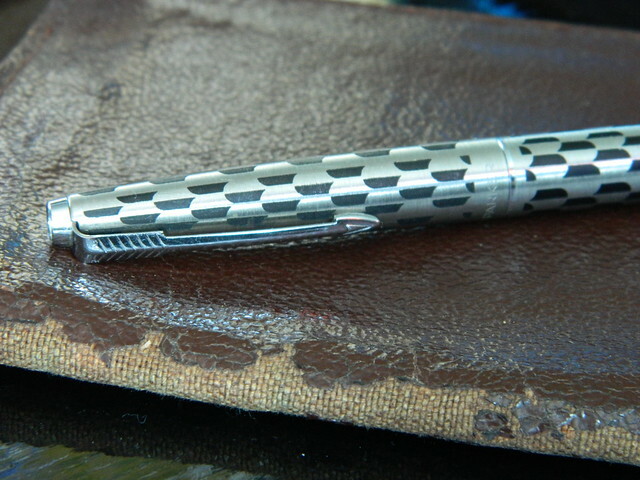 Just for the sake of interest, the pen is pictured lying on my paternal grandfather’s wallet. The wallet dates back to 1939, and has been carried through one world war more than I hope to ever see. It was definitely a trip for rummaging through old desks—I loved it. 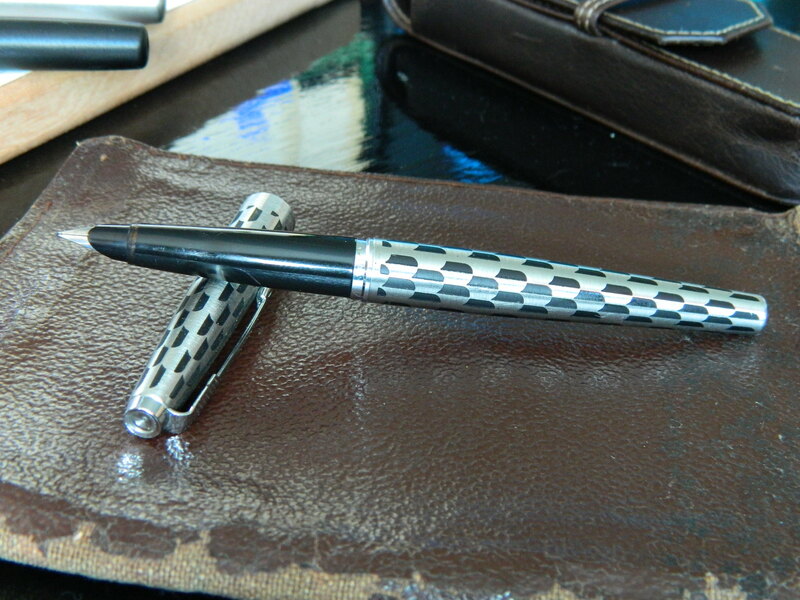 The Parker 45 Harlequin came in a small number of etched patterns, and I’m given to understand that the dark shield design, sometimes called the black shield, of this pen is quite rare. The body is a brushed stainless steel, with the shield pattern etched onto the barrel and cap, and a chrome plated clip and trims. 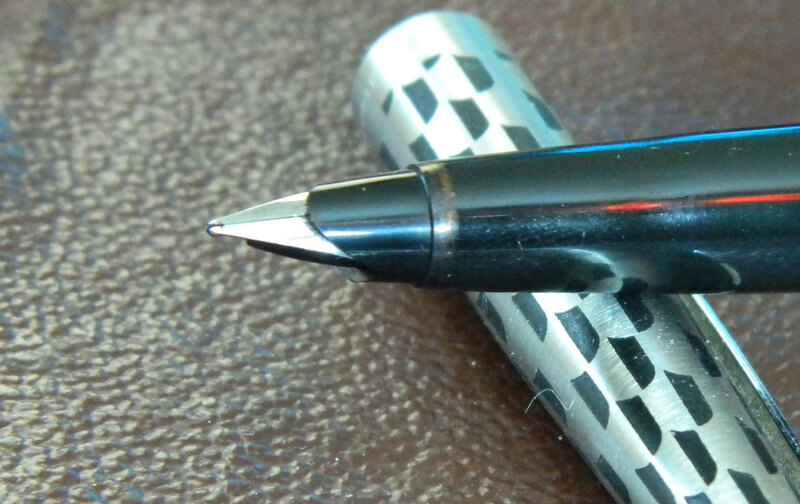 The clip on this pen sits as firm as ever it did, and lies flat and straight against the cap. The cap is stamped around the bottom rim with the Parker logo, PARKER name, and MADE IN ENGLAND QC. This model was manufactured and sold in England from about 1981, and withdrawn in 1983. It’s a small window, which I suppose accounts for its rarity, and fits in with my recollections and school years. 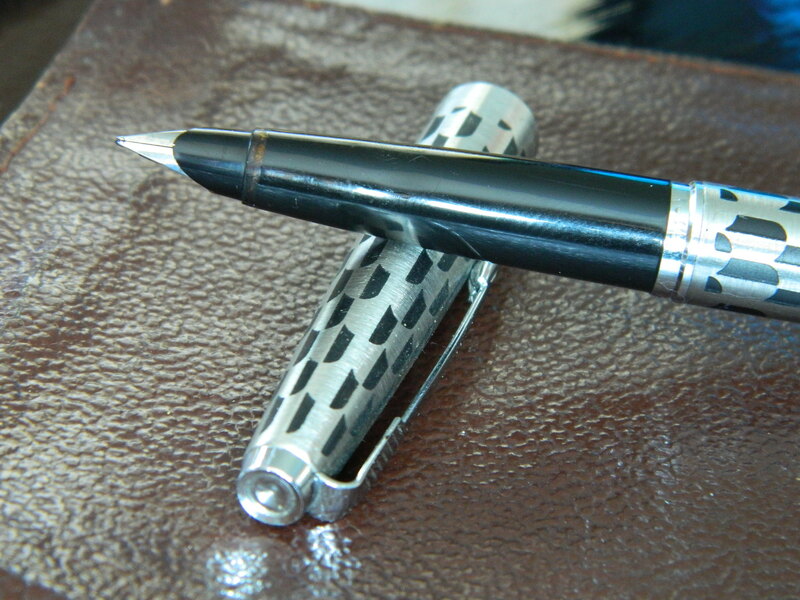 It’s quite a slim pen, and quite long in the hand, measuring about 135mm capped, 127mm uncapped, and 149mm posted. 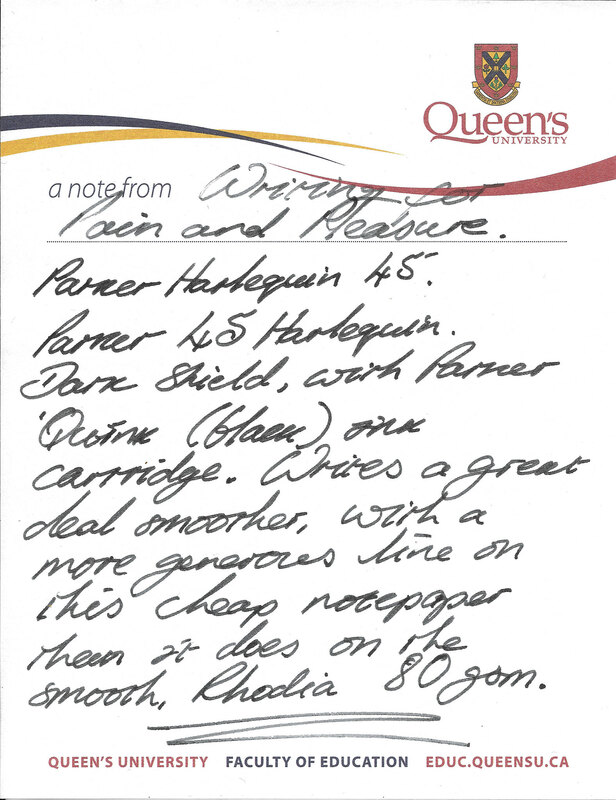 The 45 Harlequin used to come as a cartridge/converter filler, and squeezebox model; but as you’ve gathered from the above, this one takes standard Parker cartridges. Probably all for the best, since the headache of maintaining/repairing the squeezebox mechanism would have been something I could quite easily live without. The nib is steel, and required some considerable cleaning and not a little judicious rubbing before I could coax a nice line out of the tip. But after a little work, it rewarded me with a page full of unfaltering script. I estimate the nib size at a fine/medium—not as generous as the Lamy Aion for example, but more so than a fine Platinum Balance. 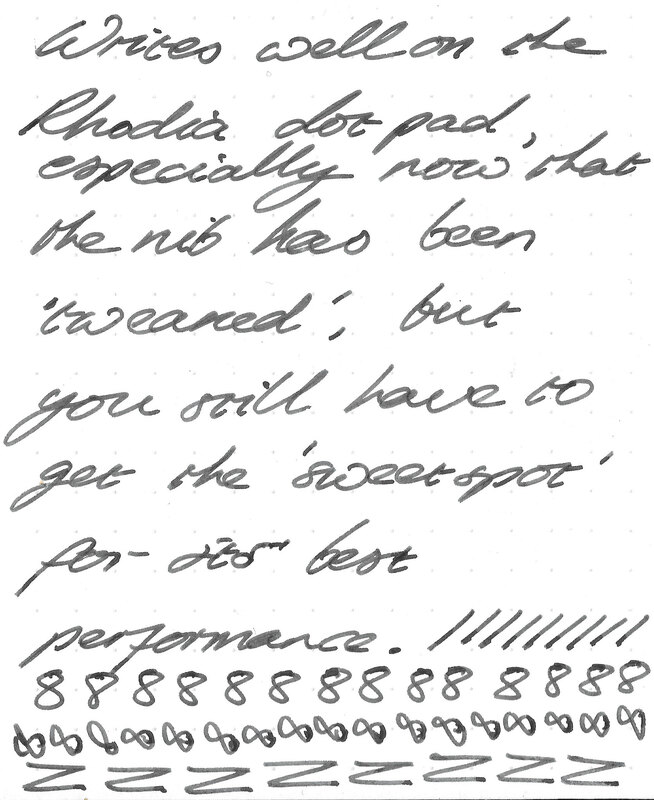 On the Rhodia 80gsm Ice-White paper I tested it on first, I have to say, it wasn’t a great writer. The ink flowed, but if I turned the pen just a fraction too far in any one direction, or angled the nib too far over, then I lost the sweet-spot, and it became very dry indeed. A touch more tweaking and this improved no end. You still have to find that sweet-spot to get the best out of the pen, but it’s not as evasive as it was at first. Then I tried a bit of cheaper paper… and that was a major leap forward. This pen definitely prefers paper with a bit more tooth to it than the smooth Clairefontaine/Rhodia stock I usually use. When coupled with the right paper, this pen becomes an absolute pleasure. I’m still a little thoughtful (concerned would be too strong) about the condition of the nib, despite how well it writes. I haven’t owned a vintage pen before, and I would like a more skilled eye to check it over, and maybe improve the writing experience even further. But until then, this is a real jog down memory lane, and brings a smile to my face every time I look at it, and think of my mother’s warnings to take great care of her pen… I will mum, I promise this time. Gorgeous, and what a treasure to have your mother’s pen! I’m no expert on the Parker 45, but I know a little about Parkers, and I think if you get tired of cartridges, any contemporary Parker converter should work in it. Here’s to years of good writing with it! Thank you Laura, yes the converter was my next step. I’m kind of looking forward to playing with this pen. Great story. It’s good to see a pen with a connection to your family’s story get a new lease of life. 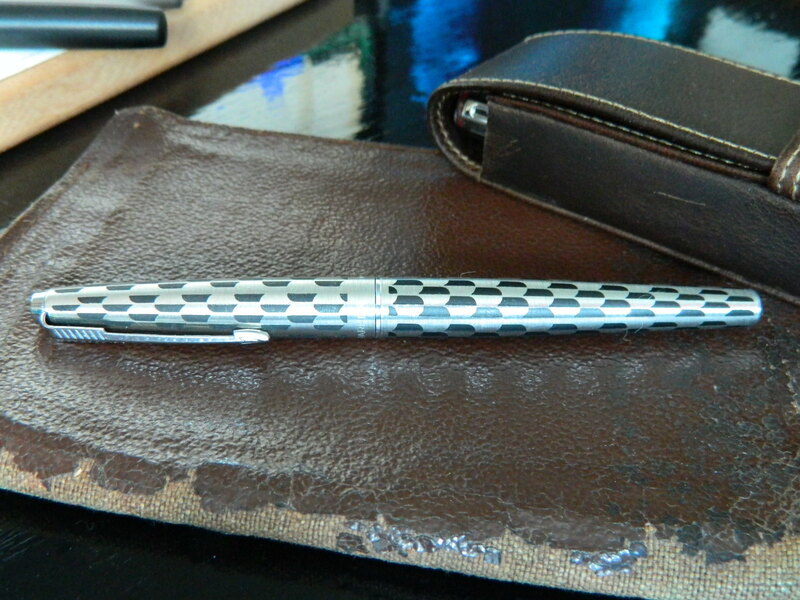 I have a Parker 51 that my mother was given on her 18th birthday. Like yours, the nib could do with some fettling to get it back to its best. To my shame, I haven’t yet got round to it. 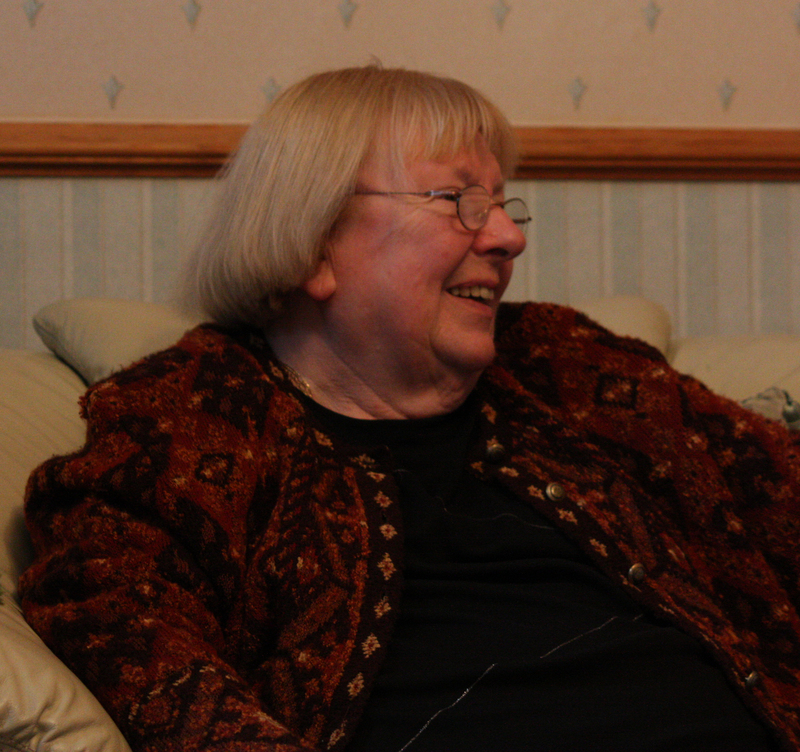 This has inspired me to get on with doing something about it – thanks for prodding me!